“I’m not diabetic anymore. No medication needed,” Carey crowed recently. And my, how the entertainment blogs are having a field day with the story. Most doctors maintain there’s no cure, as well. But here’s Drew Carey nonetheless. What more do you need in order to call him cured? The only way he’d really be cured, they feel, is if he was able to pig-out on his old diet of donuts, KFC and Big Slurpee’s — the one that gave diabetes in the first place. This is crazy. Why should he have immunity to the junky foods that are giving thousands of people Type 2 diabetes and prediabetes every single day? That’s not a cure; that’s a miracle. Our definition of a cure would be anything that returns a diabetic’s metabolic functions to normal without the ongoing need for drugs. In short, a second chance. Now that he’s done it, maybe the medical community — and the 80 million Americans with Type 2 and prediabetes — will see that the solution to today’s diabetes epidemic is right under our nose. There’s certainly been sufficient medical research and credible studies to prove the point. And my own success with diabetes patients over the years demonstrates beyond a doubt that Type 2 absolutely can be reversed. Type 2 patients can indeed get off all of their diabetes-related meds. (And most are on quite a few.) They don’t have to monitor their blood sugar — or stick themselves with needles around the clock. Or live in fear of going to sleep and not waking up because their blood sugar dropped too low. Or wondering when they’ll lose their eyesight or have limbs chopped off. We’ve even seen Type 1 diabetics reduce their insulin doses dramatically (in some cases, by up to 80%!). And most Type 2s can achieve these results much easier than Carey did. His approach was definitely the hard way. In order to reverse his diabetes, the 52-year-old comic lost 80 pounds, going from a size 44 waist to a 34 in about seven months. His secret? “Lots of cardio,” he said. “At least 45 minutes of cardio, six days a week.” He also worked with a personal trainer who watched over him, providing regular advice and motivation. Then there was his diet. He cut out carbohydrates (although he admits he cheated a few times) and gave up crackers, bread, pizza, corn, beans, and all starches. Instead, he eats lots of egg whites, fruit, and Greek yogurt. His sole beverage is water. A typical dinner consists of grilled chicken and steamed non-starchy vegetables, accompanied by a glass of water. See why do I call it “the hard way”? 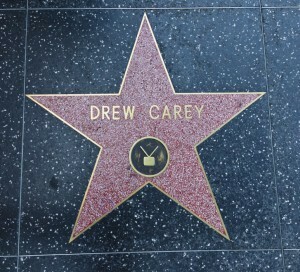 It’s easy to see why the Hollywood crowd is now engaged in “The Drew Carey Watch.” They’re waiting for the paparazzi snapshots that document his re-blimping. This already may have begun. Man does not live by egg whites and water alone. So our bet is that someone with a lifelong love of food and eating like Carey has, won’t stick to this Gulag-like menu much longer. Drew, dude: There’s an easier, more pleasurable way! If we had his ear, the first thing we’d suggest to Carey is to fire the guy that’s coaching him. For one thing, weight loss isn’t the road to reversing Type 2 diabetes; it’s just a signpost along the way. When a diabetic stops eating the sugary foods and fast carbs that pump up his blood sugar levels and trigger insulin surges, weight loss occurs naturally. That’s because insulin’s main job is to turn all that blood sugar (called glucose) into fat (technically, triglycerides) and store it in the fat cells around your waist, hips and everywhere else. By reducing glucose and insulin, your metabolism will start burning your stored body fat for fuel. Result? 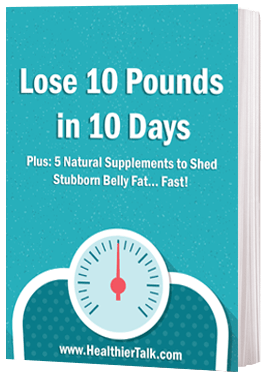 Your body starts to shed pounds automatically. Climbing off the couch definitely will enhance this process. But 45 minutes of intense cardio is extreme and unnecessary — unless you just love running. 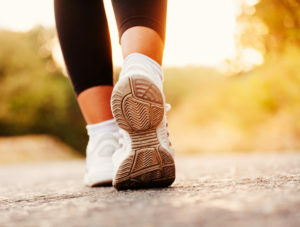 If you don’t (and we only know a few folks past 50 who do), a daily 20-minute walk – or some yoga, dance lessons, gardening, stationary cycling, swimming, etc. — is sufficient to stoke your metabolic furnace. Drew’s six-days-a-week of cardio will knock pounds off of him, all right. But after the water weight is shed, a percentage of those lost pounds will be muscle. And at 52, he can’t afford that. First, the more muscle we have, the greater our basal metabolic rate (this means the number of calories we burn at rest). Second, muscle cells are much more sensitive to insulin than fat cells, so they require less of the hormone to get glucose inside where it can be burned for fuel. In a nutshell, more muscle means less glucose in the blood – and a reduced need for insulin. Here’s our point: By spending three of those cardio days adding muscle to his frame, Carey could have turned his body into a lean, mean calorie-burning machine that slimmed him as he slept. And since adding muscle would have lowered his glucose levels and his insulin demand, he could have reversing his diabetes in a way that that would have a lasting effect. And by putting most of his effort into cardio exercise, Carey missed a bigger opportunity: His diet. Study after study shows that exercise by itself is a pretty poor way to lose weight. What you eat and don’t eat is far more important. Cutting out the crackers, chips, fried foods and sodas was a smart move because these are the foods that make your blood sugar and insulin levels rise like the Mississippi River after a torrential downpour. Instead of subsisting on egg whites and water, Carey would have been much happier (and healthier) by building his diet around slow carb foods, free-range meat products and omega-3 seafood. His choice of yogurt was smart (a lucky guess?) because several studies show that it’s natural calcium inhibits appetite, while the beneficial bacteria teeming in it convert sugar into lactic acid, thus by-passing the glucose-insulin cycle entirely. Trashing the egg yolk was bone-headed, though. Research at St. Louis University found that people who chose eggs for breakfast ate fewer total calories at lunch and dinner because eggs (and protein foods in general) satisfy hunger longer. And axing beans and corn was just plain dumb. That’s because both are “resistant starches” which bypass the small intestine (where other carbs are broken down into glucose) and, instead, are digested in the large intestine by bacteria. This results in a negligible rise in blood sugar and insulin – and sometimes none at all. Beans are the #1 diabetes-fighting food on earth! Here’s medical proof: Type 2 diabetes patients who consumed a mere one-cup serving of beans improved their blood sugar enough to reduce their medication dosage, according to a study published in the New England Journal of Medicine. Dr. James Anderson demonstrated that Type 1s who add beans to their diet were able to reduce their dosage of injectable insulin by a whopping 38%! In some cases, this allowed Type 2s to completely eliminate their need for supplemental insulin! And researchers at the University of Southern California found that overweight Latino children (a population with a much greater incidence of diabetes in the US) lost weight and showed significant improvements in their insulin response simply by substituting a half-cup of beans for one daily soda. But Drew could have lost all that weight (and even more!) without starving and driving himself like Sylvester Stallone did to get ready for those beefcake scenes in his new movie, The Expendables. You see carbohydrates are not the evil foods most people think they are, a misconception popularized by Dr. Robert Atkins. Instead, there are good carbs and bad carbs – and it’s the bad ones (sugar, sweeteners, sodas, candy and refined wheat products such as bread, baked goods, chips, and French fries) that should be shunned. Good carbs like fruits, vegetables, and whole grains are a diabetic’s best friends because they contain lots of fiber, which slows their conversion into blood sugar. Since they take longer to digest, they satisfy hunger better so you wind up eating less. Consuming a little high-quality protein (fish; free-range meat and eggs; artisan cheese and other dairy products) with these “slow carbs” quells your hunger even longer and adds variety to one’s diet. And variety is key. After all, food is about both pleasure and health. If Drew has any hope of maintaining his new weight, he’d find a diet that will satisfy both. Today’s health statistics are dismal – and while it was probably unintentional, Drew Carey is the high-profile embodiment of our current obesity/weight loss dilemma. More than 70% of the American population is either overweight or morbidly obese. Nearly 30% of us already have some form of diabetes or on the threshold of developing it. How’d we get here? Bad food choices. The food industry suckered us into getting hooked on all manner of junk that made them a fortune – and made us sick. All those convenience foods made it easy for us satisfy our advertising-driven cravings, while never considering the consequences of our non-stop, unconscious nibbling and noshing. Having diabetes adds 15 years to your appearance (due to accelerated oxidation) and subtracts 20 years from the patient’s lifespan. And it’s not a pretty way to go. A diabetic’s odds of heart attack are 400% higher than the general population. In fact, 75% of all diabetes-related deaths are from cardiac failure. And diabetes drugs can’t protect against these complications. Neither does aggressive glucose lowering. Studies confirm that you can have perfect blood sugar and still succumb to complications and premature death. The only true solution is to reverse this disease now if you have Type 2 – or dramatically lower your insulin dose if you’re Type 1. And both can only be achieved by modifying your diet and lifestyle. It usually takes an “a-ha!” moment like this to trigger a turnaround in a person’s condition. Tragically, this never comes for the vast majority of people with life-threatening medical problems such as diabetes, heart disease, depression, or obesity. It’s just too easy to remain in denial. Or entertain blind hope that you’ll be one of the lucky ones who beat the odds without lifting a finger to improve your chances. But a small percentage of people like Drew Carey actually see the writing on the wall and decide to make a change. He may not have done it perfectly – or he could have taken an easier route. But what counts is that he did it. He got sick and tired of his situation and he changed it. He’s an example and inspiration us all. At least, we hope he will be. I would tell Drew to use high intensity interval training to cut his work outs to 12-15 mintues. Precisely. Adkins cut them out for only two weeks. “carbohydrates are not the evil foods most people think they are” – SO true. As you say, complex carbs with a little protein are actually good for us. So Drew Carey went on an extreme diet and exercise plan and lost weight. Now what? The problem with his plan, just like those diet food plans you see on TV, is that there is no exit strategy. Once you get to your target weight you have to continue eating that garbage or you will gain it all back because you still haven’t learned good eating habits, the real solution to maintaining a healthy weight. So Drew Carey really going to eat egg whites and yogurt every day for the rest of his life. Really? Makes my butter burn when people misinterpret Dr. Atkins. Like one of those women tried to suggest that Dr. Atkins would have us consume Crisco instead of an apple. My issue with the Atkins plan was his meal replacement bars in that they contained Splenda. I called them on it and like everybody else gave a generic response that nothing had been discovered to suggest that Splenda caused any harm. I stopped eating the bars and started taking raw veggies and fruit to work instead. I’m 64+ years old and I’m fat and I need to do something to turn things around. I don’t see that happening in the not too distant future. I still drink too many soda pops and junk food. 🙂 My hat is off to Drew Carey even if he did do it “the hard way”. The 30-Day Diabetes Cure, is the first day-by-day, step-by-step guide to reversing Type 2 diabetes and prediabetes, while showing people with Type 1 how to dramatically reduce their insulin dose. I read this book and i found amazing improvement in myself. 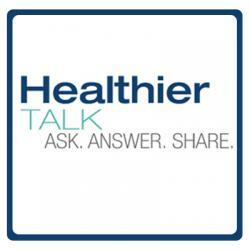 Moreover should be implemented to make our community more healthier. It is the refined flour products, and processed foods, and certain ways of cooking things that are giving us disease. They CHOKE OUR CELLS!!!!! Like clogging a HOSE! I had to give up….. Cookies, pies, cakes, donuts, pizza, candy, soda pop, wheat, egg, and soy, and most sugary things in all forms. All things with gluten. And ALL JUNK FOOD TOO!!! (that is what killed Jerry Garcia! He only ate JUNK FOOD!!!!!). These things block our system and choke our bodies, and GIVE US VITAMIN AND MINERAL DEFICIENCIES!!!!!! The body thinks it is STARVING! So it STORES FAT!!! And you get diseases because NO MATTER HOW MUCH FOOD YOU EAT, YOU ARE NOT GETTING YOUR NUTRITION!!!! IT IS BLOCKED!!!!!!!!! SO YOUR CELLS STARVE!!!! DISEASE IS CAUSED BY DEFICIENCY!!!! SCURVY WAS A VITAMIN C DEFICIENCY!!!! PELLAGRA WAS A B DEFICIENCY!!!! YOU CAN HAVE A DEFICIENCY OF STOMACH ACID. THAT WOULD NOT BE ENOUGH ACID TO BREAK DOWN YOUR FOOD COMPLETELY, GIVING YOU A CONDITION WHERE YOU DO NOT GET YOUR COMPLETE NUTRITION…..Sorry for the CAPS but this is an important point!!!! Also, too much of the WRONG FATS. There are bad fats, and good fats. Just like LDL and HDL cholesterol. GOOD SUGARS AND BAD SUGARS TOO!!!!! You can have a deficiency of PRO-BIOTIC BACTERIA. GOOD BACTERIA THAT AID DIGESTION. You can have deficiency in ENZYMES, That aid digestion and clear the body of bad stuff. The “American” Diet makes your system ACIDIC!!!! YOU NEED TO CHANGE IT BACK TO AN ALKALINE SYSTEM. DISEASE LIKES AN ACIDIC SYSTEM!!!!!! Alkaline Drop products can help do this. But it is also eating an Alkaline Ash diet. Foods that turn alkaline when digested. So EAT RIGHT!!!!!!!!!!!! If you give up the wrong foods, and eat the good foods, you will feel better and stronger. That is the essence and the TRUE FOUNDATION of good health! I was diagnosed t2 19 months ago. I took the Drew Carey route. I too lost 80 lb. in7 months an got off my meds. In the last year I have spent nearly 400 hr researching and my conclusion supports the author. Good carbs, protein and omega 3 plant and fish foods and combination of cardio and resistance training have cemented my reversal of t2. I am 58 years old and lookng forward to remaining “reversed”. Well if you know that ATKINS, not Adkins, only forbid healthy carbs in the first two weeks, why did you smear him that way? Vegetables are the largest portion of his diet, and if you actually took the time to read it, you’d find it fits right in with your ethos. don’t act blindly. Sorry for the typo – you are right, it’s Atkins. But I didn’t smear him. I said that in the real Atkins diet he only cut carbs for the first two weeks. It is undeniable, though, that the Atkins diet popularized a misconception that carbs are evil. Good comments….all. But having been t2 for about six years now, one thing is undeniable. Reversing it takes real effort. Not many people will have that claim to fame. I eat sensibly about 50% of the time. Have slacked off on my exercise. I intend to ramp that back up. But diet, I know, will continue to be my biggest obstacle. Glad I read this. It is going to give me the fresh start I need. I was wondering if anyone was familiar with “The China Study”, which makes the case that diabetes, among many other diseases, is an immune disease caused by the consumption of animals and animal products. Our normally-wise immune systems mistakenly start attacking our own bodies because the cells of animals are so similar to our own. The scientific basis for this hypothesis was a ten year study of rural communities in China, which were too poor to eat animals and animal products. Virtually no immune diseases, including diabetes, were found. While exercise obviously was a factor, many active people here in the states, my sister included, have diabetes. Are we not considering this as a strategy because we Americans can’t change our eating habits? The one weakness of the so-called vegan diet is the lack of Vitamin B-12. Either get a doc to show you how to give yourself B-12 shots or take the sub-lingual lozenges. The China Study was a farce and the real culprit when you see the original studies and their correlations tells a very different story. The real culprit points to wheat and I concur completely especially if it is not soaked or sprouted. Too many grains are difficult for the body to break down. Rice cakes are pure garbage, overly processed. So is oat bran. Worse thing for a person with digestive issues. Don’t forget cholesterol. Because most people think it’s evil we have an epidemic of disease here in the U. S. Truth is cholesterol is essential to create cells properly and make them permeable. Instead they are too hard and glucose and other nutrients can’t get into the cells properly. I have lost 50 pounds and most of my chronic health problems eating 60% fat from whole eggs, whole real kefir, and lots of butter and coconut oil. Also forgive everyone if you really want to get well. I totally agree with you here. 2 years ago, my husband and I stopped consuming all refined sugar and simple carbs. We eat moderate amounts of fruits and vegetables, but we do consume lots of dairy and other animal products with no ill effects, contrary to what many people say. We are amazed at how much our health has improved. Neither of us had diabetes, but my husband believes that he was pre-diabetic before our diet change. He also had hyperthyroidism, high blood pressure, attacks of gout, mood swings, low energy, and he was overweight. After changing our diet, he lost 60+ pounds in 3 months. All those health problems he had disappeared. He no longer takes his thyroid medication either. For me, I was never overweight, nor had any serious health problems, but I did suffer from seasonal​ allergies and indigestion after meals at times. Now, these are not issues for me. I actually lost 10 pounds and have much more energy, which is a welcome bonus. So, we are convincd that our new way of eating made us healthier. The diet is called “Ketogenic diet”, if you want to do research on it. It basically is a high (saturated) fat low carb diet. It’s a way of life for us now. It’s not easy to do at first, but it can be done if a person is determined enough to get healthier. Only strong people will succeed at this. What difference does it make whether or not diabetes can cured or not? When people no longer have to take medication for diabetes, that’s fantastic. Keep up the good work Drew, he found something that works for him and that’s all that matters. Carey started with a detox diet that lasted two weeks, and which included vegetables, lean protein, fruits, vitamins and supplements, as well as 64 ounces of water every day. Carey also exercised six days a week, about 45 minutes a day. His workout routine included bike riding, jogging, treadmill, swimming, water jogging or elliptical. I am praying that this is successful for me! I am a 60 year old Diabetic with Diabetic Neuropathy, weighing 125Kg. I am on NovoMix 30 Flexpen Insulin. I inject 30 units before Dinner. When I was diagnosed my blood sugar was dangerously high, 80 and only for a stone in my kidney blocking my utterer, I would have gone into a coma. The only symptoms were dry mouth and peeing like a horse. I used to take 1 Nuseals Aspirin 75mgs tabs.1 Nebimel 5mg tablets. 1 Micardis 40mg tablets, every morning. And I took 75mgs of Lyrica at night for my neuropathy. Before Breakfast I eat 3 raw crushed cloves of Garlic, a teaspoon of Oregano herb, Thyme herb, Sage herb & a pinch of Ground Cloves mixed with a tablespoon of Almond Oil. I also take a handful of Pumpkin seeds to clean out my system of any parasites. Then I take 50ml of Apple Cider Vinegar in a glass of water. 20 minutes later, I use 3 Organic raw eggs & a tablespoon of Whey Protein & a tablespoon of Linwoods Milled Flaxseed-Almond-Brazil Nuts-Walnuts & Q12 as a Smoothie every morning for Breakfast. After I use the egg-shells & a banana, in a Smoothie to give myself good healthy calcium. Boil the eggshells in water for a minute or two to kill off any bacteria. But I now I have my 50ml of Apple Cider Vinegar first thing in the morning in a glass of filtered water. 30 minutes later I have 1 mug of freshly ground coffee. I then do an hour or 2 on my Cellerciser. I do that a few days a week. After my coffee this morning my blood sugar level was 6.7 and after 2 hours of Rebounding on my Cellerciser it went up to 8.8. I drank a smoothie of Whey protein and blueberries and checked later to find it down to 4.9. I have some fruit or nuts during the day and about 4pm I have my main & only meal. This consists of Leg of Lamb or Lamb chops, some salad and a bottle of red wine. I do a Colon Cleanse every few months. I am using 1 dessertspoon of Bentonite clay & 1 dessertspoon of Psyllium husks. It is one of the greatest & cheapest Colon Cleanse around. I try & drink a few pints of water a day. I take 1 spoon of crushed cinnamon; I also take a drink of Bitter Melon. Bitter melon is one of the best vegetable-fruit that helps improve diabetic and toxemia conditions. You cut it open & remove the seeds, chop it up & put it in the blender with plain water. After that, put it in a bottle & keep in the fridge. My blood sugar ranges from 4.9 to 8.8, so I think I am on top of things. I also take Blueberries, Cranberries, Strawberries in a Smoothie. At the moment I am taking 300mg of Vitamin B1, 5 tablet of Vitamin B12 25ug, 4000 ug of Vitamin D, 600mg Alpha-Lipoic Acid, 500mg L-Carnitins, 4mg Astaxanthin Complex, 30mg Zinc, 2 B Complex caplets1000 mg Calcium, 500mgMagneuism, 400ug GTF Chromium, 400ug Selenium, & 3500 mg Brewers Yeast. I also take 500mg of Milk Thistle. The ONE thing I cannot get rid of is the Diabetic Neuropathy in both my feet and you fail to address this problem. In 1997, Dr. Richard Bernstein’s book on lowering your blood sugar and controlling diabetes without medication was published. The book is called, ‘Dr. Bernstein’s Diabetic Solution’. I read the book so I could understand my father’s diabetes. While reading it, I realized that it was the perfect weight loss book, also. However, I was too busy and too ingrained in my eating habits to use it for weight loss. A few years went by and then I was diagnosed with elevated blood sugar. I was in the pre-diabetic range. That was my wake up call. I remembered some of the things in Dr. Bernstein’s book and headed for my bookcase to retrieve the book and do some serious reading. I implemented his diet, along with a brisk walk everyday and I lost 52 pounds right away. It’s been 10 years since that diagnosis of pre-diabetes and I’m still not a full blown diabetic like my dad. No medications, just Dr. Bernstein’s diet. I once talked to a woman who was a diet controlled diabetic and she was 70 years old. She truly inspired me and I believe proper diet will work for me also. So, the new book on the market called, ‘The 30 Day Diabetic Cure’ is NOT the first diet to reverse diabetes through diet. Dr. Bernstein hit the nail on the head long ago. One thing I know, is that we all should get serious about what we put into our bodies. If it doesn’t grow out of the ground in it’s present condition, then we shouldn’t put it in our bodies. In other words, try to eat foods in their natural forms, not the overly processed things in the grocery stores. When you stop buying high priced processed foods, you have plenty of money for fresh veggies and fruits. Plus, you get the great benefit of natural vitamins. Pip, it sounds as though you have a great handle on your diabetes. Diabetic neuropathy probably can’t be reversed, but who knows? Maybe you need some more time for that to happen. I want to wish you the best of luck and if you can read Dr. Bernstein’s book, he may have a solution for you. I bet you can get one of his books from Amazon for a good price. Pip….. I checked Dr. Bernstein’s book, and yes, he does talk about reversing diabetic neuropathy. So, get his book and read it through. He’s very thorough in his writings and it is important to truly understand how diabetes develops and affects the body. I hope this helps…. good luck and best wishes! But since reading about the 30 day cure and what iv read here,it makes me think i should be doing something more as im not getting any younger as they say, and now that we don’t have a drug plan anymore as my husband lost his job as they close it doors ,the cost of the sensor sticks and insulin and the other stuff i need, and of coerce id like to live a little longer with all my parts intact..i just dont know how i would go about it .. But Pips diet wow i couldn’t imagen a diet like that . My husband also found Dr. Bernstein’s book soon after he was diagnosed with type 2 diabetes. He has been able to keep his A1C around 6 using a combination of diet and exercise for probably 15 years. I say whatever works for you do it whether it is the way Drew Carey did it, the way Dr. Ripich suggests, the way Dr. Bernstein suggests, using herbs and vitamins, etc. Each person needs to feel comfortable with their way to health and if it works Yes!! !